Hey, we grew up cross-eyed, with a Teutonic resistance to tan skin, and an overbite befitting a kangaroo. We weren’t planning on winning any beauty pageants … ever. So ShowMojo has always been about leasing automation — saving you (or your showing agents) three or four or more hours each day. That’s the savings you get when prospects get immediate actionable replies to their phone calls, emails and text inquiries. More important, still, is that ShowMojo gets your prospects to do the heavy lifting for you — by empowering them to self-screen, self-schedule, self-confirm, self-survey and so much more. We can go on and on and on about this. But then you’ll stop reading. So we won’t. The point? Just have a look at your ShowMojo listings on any smartphone. Use a slice-of-fruit phone, or a fruity-robot phone, or one of the many also-ran awards. 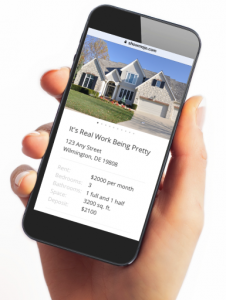 Do your mobile listing pages look prettier now? This is a work in progress. We started mobile-first, because that’s our world. Three out of four prospect-scheduled showings are completed on mobile. In the coming months, we will continue to build out the mobile experience. Desktop web will come after that. So be on the lookout for more pretty. P.S. Do please keep reading these newsletters. We know it’s summer, but there are a few other big announcements on the way.